How Bright is that Meteor? It was a question posed by a school student in the Adelaide Planetarium. I really had no idea. Just how many light bulbs worth of light does a particular “shooting star” emit? To work this out is a complicated process involving the meteor mass, composition, velocity, angle of entry and atmospheric physics that had me rattling my brain for months. But there is also a simple rule-of-thumb I derived that can give a quick good-enough approximate answer in a few moments by consulting a look-up table. Casual star gazers are well aware of these streaking particles of dust or rock incinerating in our upper atmosphere, sometimes putting on a meteor shower when Earth ploughs through a swarm of them. These remnants of early solar system formation, debris of asteroid collisions and particles left behind by visiting comets collide with the Earth’s atmosphere as it moves around the Sun at 30 kilometers per second. Meteors can plunge into our atmosphere anything from 11 km/sec to 70 km/sec heating up to thousands of degrees emitting a portion of its energy as light that we see as a “shooting star”. After reading through a few (sometimes impenetrable) documents on what happens as a meteor burns up I was frustrated that there was nothing on how much light a typical meteor emits in user-friendly terms nor how to calculate it. What I was looking for was the lumen output of the meteor during incineration. This could be easily converted to light bulb brightness units. For example, a typical household light bulb emits 800 lumens (60W old fashion incandescent equivalent). If you are star gazing and a meteor streaks across the sky overhead and reaches a maximum magnitude of say -3 (somewhat brighter than Jupiter) how many light bulbs worth of light is that meteor emitting? An internet search found at least two pieces of program code both in BASIC. An old one from Sky and Telescope, January 1987 issue METEOR.BAS and a more recent one from the Australian Space Academy METFLITE.BAS . Both give somewhat different results for the same meteoroid input parameters but at least provide a guide. They work best for meteoroids less than 1 kilogram. Readers familiar with BASIC programming may download and try for themselves with the links at the end of this article. Both programs require an input of mass, density, velocity and zenith distance angle of entry. The programs then chew through the complex algorithms that models what happens as the meteor plunges into the atmosphere. The results are a timeline table in steps of fraction seconds of the meteor flight ending its career as height, velocity, deceleration, mass loss and visual magnitude. All this I was hoping will give me the info I needed. But the best these programs delivered was the meteor’s visual magnitude and energy in watts. Lux is the amount of light received from the meteor at ground level. This gives us lumens once we know the meteor distance and its visual magnitude Vm. I added this as extra lines of code to the Sky and Telescope BASIC  program and finally got my meteoric LIGHT BULBS! Here is an example of a meteor I observed in December. It was moving from the Gemini/Orion direction from the north-east in late evening. It was very slow and gradually built up in brightness greater than Jupiter but less than Venus. After several seconds it culminated in brightness almost overhead. Total time was around 5 or 6 seconds. I estimate magnitude about -3.0. Perhaps it was an early Geminid which are known for their slow burn. After several attempts inputting experimental mass, density, speed and zenith distances into my modified Sky and Telescope METEOR.BAS code I received an output that seemed to match my observation. The meteor was an 8 gram rocky type with a density of 2500 kilograms per cubic meter, a velocity of 35 kilometers per second and entering zenith angle of 65 degrees. The program begins output (Table 1) when the meteor reaches magnitude 0.1 at three seconds into flight and continues to magnitude -3.1 about 5 seconds into flight when it glows with the light of more than 3000 light globes before it rapidly extinguishes. This presumes a maximum brightness achieved near zenith as it was for my observation. If the meteor peaks at an angle lower than at zenith, then it is further away and is further dimmed due to atmospheric extinction. This means its intrinsic brightness must be greater than the same magnitude meteor at zenith. Readers can find approximate corrected values to the intrinsic brightness for zenith angles other than zero in Table 2. It turns out those meteors less than 1 kilogram burn up at a height between 70 and 100 kilometers. Those in the range of a few tens of grams consistently reach peak magnitude around 75km. Armed with this knowledge it is possible to adopt a generic meteor model that relates magnitude to lumens directly, that is to light bulbs, without complex calculations but with less accuracy. This is also provided by Table 2. Simply look up observed magnitude, its zenith angle (or altitude above horizon) and read off the light bulb value. Of course the mass, density and other properties of the meteor are not available in this simplified method but it should satisfy an audience at a dark sky site or in a planetarium wondering “how bright is that meteor really?” Thanks to Andrew Cool for helpful discussions and program code assistance. 1. Sky and Telescope METEOR.BAS https://www.skyandtelescope.com/astronomy-resources/basic-programs-from-sky-telescope/ See note 4 for author’s modified code. 5. Readers may wonder if I saw an Iridium flare. Note this is near midnight when any Iridium satellite is deep within the Earth shadow and is not capable of catching any sunlight, especially from overhead! Time; in seconds. Height; altitude overhead. Speed; kilometers per second Decel; deceleration meters per second per second. Mass; percent remaining mass. Visual mag; visual magnitude at zenith. Power; energy in watts. Lumens; intrinsic amount of light emitted in the visual range. Lamps; equivalent light output in 800-lumen light bulbs. In the above table read the visual magnitude in the left column then zenith distance (or the complementary altitude) in top rows to find a ball-park intrinsic light bulb luminousity of a meteor. Bright meteors at zenith distances of 75° or more may require a meteor larger than 1kg so the brightness figures are wildly uncertain here but are included for the sake of completion. Example: You observe a meteor at magnitude 2.5 (typical) at a zenith angle 45 degrees. This meteor burns with the light of between 68 and 23 light bulbs. Rough interpolation for magnitude 2.5 suggests around 50 or so light bulbs. 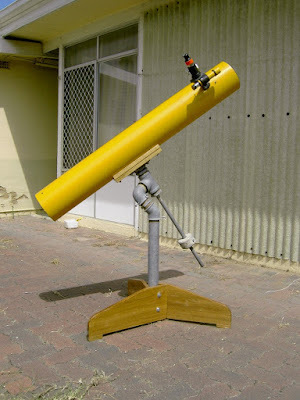 Way back in 1974 I decided it was time to build a decent telescope. Until then I observed mainly with a pair of 10x50 binoculars and prior to this a home made simple lens 30mm telescope made from whatever was lying about at the time. My new project was to grind and polish a mirror to make a 6-inch Newtonian reflecting telescope. As I frequently visited my brother’s bookshop in Adelaide it was just a short walk around the corner to Chesser Street to seek advice from John Cole from Cole Precision Optics. John supplied the Pyrex mirror blank and plate glass tool along with the abrasives and polishing formula along with patient advice on what I would be up against in making my first mirror. He also supplied me with a singular book by Sam Brown, the classic All About Telescopes published by Edmund Scientific. Its profusely illustrated pages had all the instructions on making telescopes of all kinds from simple to complex. The instructions covered mirror grinding and polishing, telescope math, mounts, photography and optical theory. I was so excited and driven that the next weekend, in the space of 48 hours, and virtually no sleep, I had ground and polished the mirror and tested it with a rhonchi set-up in my shed. The following day I handed it over to John Cole for examination. He declared it a “good mirror” — at least for a first timer, and we decided to go ahead with the coating. The optical performance subsequently turned out to be rather good showing diffraction disks and airy rings on stars on nights with steady seeing. In the mean time I had to think about what kind of mount I would choose for my 6-inch reflector. This is before the days of John Dobson and his famous “no-fuss” dobsonian telescope mount, which I’m sure I would have chosen had it been contemporary. I perused through Brown’s book at the copious choices of mounts that could be made from all manner of materials. While I would have liked to have gone for one of equatorial roller bearing mounts I felt this was a bit too advanced for me. I was instead taken by a simple mount that could be made from plumbing pipes. The illustrations showed how I could use a 45-degree elbow joint and a T-section to make a hand-push turn-on-threads German equatorial mount. The 45-degree elbow joint would serve to angle the upper part of the mount to point roughly at the south celestial pole at mid latitudes and rotate on its screw thread in right ascension. The T-section would hold a cradle with telescope and rotate on its thread in declination. All this is balanced by an opposing counter-weight. Brown suggests using 1.5-inch galvanised pipe parts for a 6-inch reflector but I went for 2-inch pipe for sturdiness and to possibly handle a future 8 or 10-inch scope. After a few trips to the hardware store to buy the joints and 2-inch pipe cut to length for the pedestal I followed Browns instructions. While the 45-degree elbow would have been quite suitable for a rough polar alignment near 45 degrees latitude, for Adelaide at 35 degrees this is too far out for comfortable equatorial tracking. It would require too many frequent corrections in declination to keep an object in the field of view as I tracked the scope. So I decide to combine 45-degree, 90-degree and T-elbows that enabled me to twist the first two into a position so that the “polar-shaft” could be set at 35 degrees. I had a friend drill and tap three holes in the lower elbow to insert bolts to lock the polar elevation in place. The lock bolts could also be loosened to adjust for a different latitude if required. The top of the mount was fitted with a timber cradle for the tube and mated to one end of the T-pipe with a flange to turn in declination. 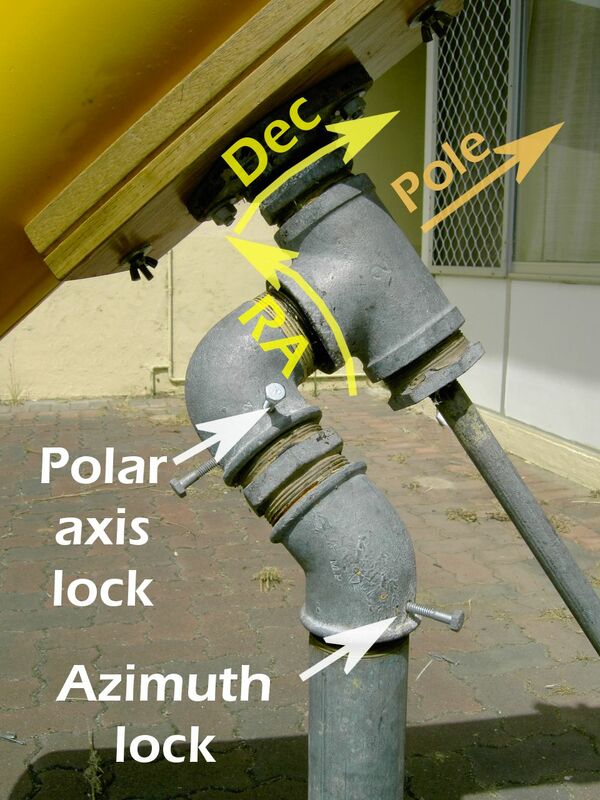 An azimuth-lock bolt was also added to the elbow mated to the pedestal pipe to facilitate aligning the “polar shaft” to south. The turning screw threads for the right ascension and declination axes were lapped (fine ground) with wet 600-grit carborundum powder left over from the mirror making process. Several twists of the mated threads smoothed their contacts. They were washed then lubricated with a layer of grease, re-mated and finally assembled on to the pipe pedestal which had three legs made of meranti timber bolted to the base. While a mount that turns on plumbing pipe threads appears to be crude in comparison to a precision roller bearing mount the pipes turned out to work remarkably well. Once the telescope tube was mounted and balanced with a counter weight the movement on the axes was surprisingly smooth. I found the natural clutch action of the 2-inch threads had very little backlash when fine aiming by hand. In fact it is much smoother than any 6-inch dobsonian that I have ever across since! In addition, when the mount is rough-aligned with the celestial pole within a degree or two I can gently hand push (or pull, depending on which side of the meridian the telescope is pointed) in just the one right ascension axis to track an object for 10 to 20 minutes at low magnification before a declination tweak is required. You give it a gentle push, let go, and it stays put. Even inexperienced visitors get the hang of tracking a planet very quickly by this method because it avoids the more tedious and sometimes confusing step-wise actions required to track an object as with a dobsonian mount. An important advantage of an equatorial mount is its ability to easily tack an object through zenith where sky transparency and seeing conditions are optimal. The alt-azimuth configuration of a dobsonian however hits a mechanical dead spot as it becomes ungainly to point along its azimuth axis aimed at zenith requiring awkward manipulation of the tube to acquire and track an object. A similar dead spot exists for the equatorial mount when the telescope is aimed at the celestial pole. But here only a small circular section of the sky is involved that is rarely targeted by telescope users. A German equatorial mount necessarily has a protruding counter weight shaft and the eyepiece will rotate to different orientations depending on where the telescope is pointed. This may require a raised footstep for some people to reach the eyepiece in some viewing orientations. And of course the counterweight adds a necessary, but a dead weight to the entire assembly. My mount plus pedestal weighs in at 15 kg compared to the wood mass of an equivalent dobsonian at about 12kg. Also my mount has several parts that need to be assembled and disassembled in the event of having to load in a car for transportation. Assembly and disassembly can take 10 or more minutes. This might be a disadvantage for the frequent dark sky sojourner. However I find the smooth push-aiming action and simple equatorial tracking of the Sam Brown pipe mount a sufficient compensation for the drawbacks. Over the years my pipe mount has served me well. The galvanized iron parts are so sturdy and robust that at the end of an observing session I bring only the telescope tube indoors for storage and permanently leave the mount out in the backyard — exposed to the elements! This saves me a lot of assembly-disassembly and carrying weight. It has survived 32 winters, summers, and seasons in between and has been subjected to all manner of weather onslaught in that time with no loss of performance! The only regular servicing is cleaning and re-greasing the threads on the turning axes every two years or so and changing the iron lock bolts when they begin to rust. Though in future I intend to use brass bolts for more permanent solution. The meranti timber cradle and tripod base with several coats of outdoor clear enamel lasted most of those 32 years though in the last couple of years had become so weather beaten that I finally replaced them with fresh timbers. Casual visitors often comment on the“contraption” standing sentinel in my backyard and sometimes venture a guess as to its purpose. Among other things it has been taken for an attempt at postmodern sculpture and a device for stringing up tennis rackets. Others have correctly guessed its purpose and one tradesperson, a plumber, and owner of a 4-inch commercially made equatorial reflector especially commented on the simple design and smooth motion of the axes. Meanwhile my astronomy friends have dubbed it the “plumber-scope”. Avid sky watcher located in Australia. I present down-under perspective of the night sky.